The Panagbenga is a four-week cultural festival celebrated annually in February since 1995, in the popular tourist destination of Baguio City, Philippines. Through the years, the festival has been a working coordination between the City Government, private sectors, and the Baguio Flower Festival Foundation, Inc. (BFFFI). Based on its recent enactments, the festival’s mandated objective has become more coherent, which is “to promote the city’s culture, unity among its people, tourism and economic industries and [to showcase] Baguio as a City of Flowers” (AO No. 008-S. 2014). The integration of environmental concerns, are indicated in some specific environmental policies and the designation of an environment/technical committee as one of the support committees. Examined literature, and documents plus oral interviews for the study, commonly trace the origins of Panagbenga to a Baguio direly needing to reclaim a sense of place, to reaffirm solidarity among its people, and, to prove it has risen anew as a worthy tourist destination, all after its devastation by a 7.7 magnitude earthquake (on the Richter Scale), in 1990. Many of its tourist attractions, hotels, schools, government buildings, and art centers were either leveled to the ground or structurally damaged, and many lives perished, turning the city into a veritable ghost town. Baguio’s status as a Northern hub of government, commerce, culture, and tourism was adversely affected. Baguio’s history of development from a pre-colonial settlement of Ibaloi families (Bagamaspad and Hamada-Pawid, 1985), into a multi-ethnic and multi-cultural city, consists of several milestones (see also, Fry, 1983; Reed, 1999; Scott, 1974, 1981; Tolentino, 2007). First, its original Ibaloi settlers, were among the seven major ethno-linguistic groups and indigenous peoples, generically called the Igorots, inhabiting the region across the Gran Cordillera Central, who resisted subjugation by the Spanish Empire, for three centuries (Scott, 1974: 2). Only between the 1820s to 1899, were they colonized, due to the Spanish missionary zeal and more mundane pursuit of gold. Second, under American colonization, Baguio became a convenient point of entry for the American gold rush, and was developed into a well-designed and planned colonial hill station. It was declared as the Philippines’ Summer Capital in 1903. Third, Baguio recovered from the ravages of WWII to become “one of the most highly urbanized areas in northern Luzon” in the 1960s, and now, in the earthquake aftermath, it has transformed into a “modern metropolis bursting at the seams” (Tolentino 2007:6). Entry of a local computer college to the Panagbenga Float Parade, the most awaited event consisting of a parade of floats showcasing the best of local and imported flowers. Taken in February 2010 by Charmaine Liberato. Baguio has many perennial attractions. It has a naturally temperate weather that turns really cold from December to early March. Abundant here are pine trees and pine-scented air, earning for Baguio the appellation, “City of Pines” (Reed, 1999). It has parks, notably Burnham Park named after the great Chicago architect, Daniel H. Burnham, who designed it, and the comprehensive city plan, and Wright Park where tourists enjoy horseback-riding. The city market and satellite markets offer many varieties of temperate or indigenous vegetables, fruits, flowers, rice (notably the native kintoman and ballatinaw), all supplied by farmers from nearby Benguet towns. Baguio is home to artists (native and non-native Cordillerans), who gravitate around avant-garde centers for aesthetes, such as the Tam-awan, VOCAS (Victor Oteyza Community Arts Space), and the BenCab Museum. Examined written sources and interviews of management, residents, business entrepreneurs, volunteers, tourists, and other stakeholders to the festival agree that initially Panagbenga was a celebration, and enhancement of all the above-mentioned historical, socio-cultural, economic, and environmental assets of Baguio. But the festival has not been spared observations and comments doubting its sustainability. Jumping off from issues and contestations on the sustainability of Panagbenga, this descriptive-normative study argues for an ethics of sustainable cultural festivals, with focus on the difficult concept of sustaining culture. Difficult, because if sustainable development is defined as “development that meets the needs of the present without compromising the ability of future generations to meet their own needs” (The Brundtland Report,in Adams, 2009/1990), what then are the cultural needs of the present and those of the future? Can culture be sustained without falling into the functionalist and humanist essentialisms of culture as noted by Parodi (2011)? The study’s main question of how cultural festivals become virtual and actual spaces for cultural sustainability is its original contribution. “Cultural sustainability” or how cultures are dynamically engaged is posited upon the more realistic concepts of cultural complexity and fluidity. The free-for-all painting event, another much awaited segment of the Panagbenga festival. Picture taken in February 2014. 19 Years of Panagbenga: From Cultural Festival to Festivalization? Getz (2010) defines festivals as “themed, public celebrations” of “community values, ideologies, identity, and continuity” and are occasions where “cultural elements are displayed which can educate an observer about the host culture and community” (2). In effect Getz considers all festivals as cultural festivals. The same is true for Presbury and Edwards (2010) who defined festivals as “generally cultural celebrations” for “community pride, cohesion, fun, and relaxation,” in the form of “carnivals, religious events, parades or heritage commemorations,” and are educational opportunities where people learn about arts and crafts, music, drama, sports, and culture (5). 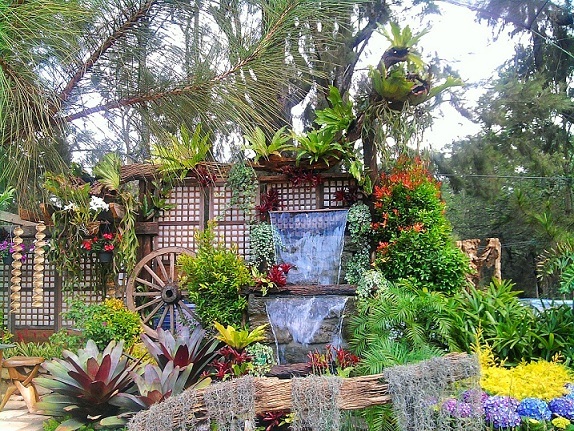 Panagbenga started off as a well-meaning cultural festival. The festival was initially attended only by Baguio residents, but as years passed it turned into a big spectacular attraction. People would flock from different places (Philippines and abroad) to join the celebration, making it the most visited festival in Northern Philippines. Panagbenga ranks seventh among the top ten festivals in the Philippines http://www.thetoptens.com/festivals-philippines/panagbenga-festival-492839.asp . Panagbenga has become a way of promoting tourism through economic means, inadvertently resulting in uneven distribution of benefits and costs. In a word, Panagbenga has succumbed to “festivalization”, a trend worldwide, which is the “over-commodification of festivals exploited by tourism and place marketers” (Getz, 2010: 5). Generally, tourism and other developmental changes, have often led to the widening, rather than closing in of gaps or disparities between elites and non-elites. The reality that benefits as well as costs of development have been distributed unevenly against poorer countries, women, and indigenous culture-bearers has spurred development ethics, an inter-disciplinary field integrating philosophy, the social sciences, and economics. Development ethics is the reflexive examination, weighing and prioritization of value choices behind development (Crocker, 2008; Gasper, 2004; Schumacher, 1989/1973). 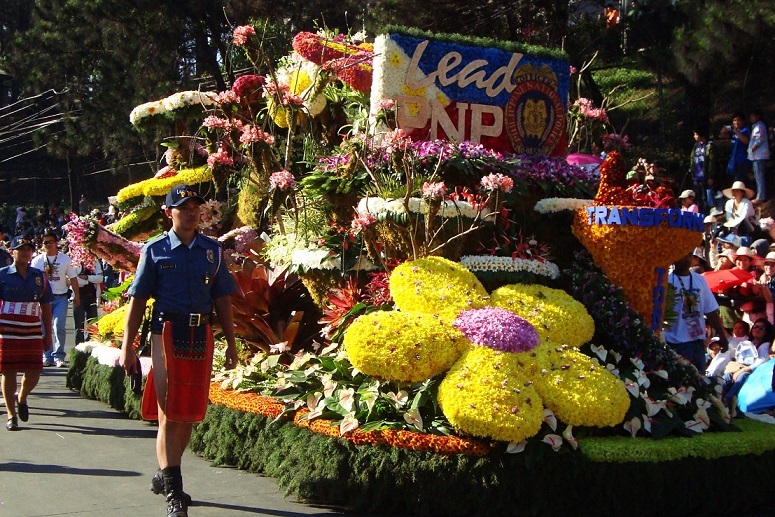 The first Baguio Flower Festival was launched in February 1996, or five years after the earthquake. It was a long-drawn idea proposed by Atty. Damaso Bangaoet, of the Camp John Hay Development Corporation (formerly an American airbase in Baguio). The timing in February was strategically chosen, because it is the coldest time of the year, it boosts tourism during the lull moments, between the peak seasons of Christmas (December-January) and summer (particularly, the Holy Week). In 1997, per suggestion of Baguio archivist/curator Ike Picpican, the festival was renamed Panagbenga, a Kankana-ey word of Malayo-Polynesian origin, for “season of blooming”. Thus Panagbenga not only conjured the blossoming or coming to life again, of a stricken city, but also the dozens of flower varieties produced by big flower farms and small backyard plots (spread in 7 hectares) employing about 5,000 contract flower growers in Baguio and nearby Benguet municipalities (Gentolaza, 1999). From a nine-day event in 1996, it has evolved into a month-long celebration. The major events and minor events vary from year to year, but proven crowd-drawers are: the Grand Street Dancing Parade, Flower Float Parade, Market Encounter to include a Landscaping contest, Session Road in Bloom, Fluvial Parade, and the Grand Fireworks Display. Minor events include pony boys’ day, variety shows, concerts, golf tournaments and other sporting events. The city’s different Barangays regularly compete thru their own landscaped gardens, and business establishments are encouraged to compete by sprucing up their facades with flowers and greens. For the past fourteen years, the BFFFI in partnership with government and private sectors have strategized ways and means of attracting bigger crowds. As a result, Panagbenga has drawn 1.6 million people a year, on average (personal interview of Vangie Payno, Chief of Staff, BFFFI). Entry to the Float Parade, a float of the Philippine National Police. Notice the policeman and the policewoman wearing their police uniforms, but as the lower part of their costume, traditional G-string (worn by the policeman) and the traditional hand-woven wrap-around skirt (worn by the policewoman). Taken in February 2010 by Charmaine Liberato. Every year, organizers introduce innovations to draw local and foreign tourists. In 2002, sporting events such as the horse race participated in by pony boys from Wright Park, golf tournament, bodybuilding contest and marathon. Since 2007, movie celebrities graced the float parade. In 2010, Shakespeare’s Camelot was staged at Burnham Lake. Since 2011, the festival shifted its organizing theme, from flowers to families. This was supported by a vision of families bonding together, as the main audience. Funding for Panagbenga, a thorny issue, has been sourced from the City Government (latest is PhP4 million), and solicited from donor corporations which buy ‘space’ in specific festival activities. Most of these support (cash or in kind) are used for prizes given to winners of different competitions, food sponsorships for volunteers, and materials for activities. Panagbenga operates with the help of over 3000 volunteers from civic organizations and local schools. In general, corporate sponsorship has proven to be the most efficient and effective way to secure Panagbenga’s economic sustainability. This, however, has given way to observations that the festival has become more commercialized over the years, evidenced by corporations who view sponsorship as a leverage to promote their products. Despite such observations, the festival management maintains its administrative independence from corporate sponsors (personal interview of Benedicto Alhambra, City Tourism Officer). Like other festivals catering to tourism worldwide, Panagbenga is at a point where it must address issues related to sustainability. First, on its environmental sustainability, the problem of waste management issuing from its commercialization, though addressed by management thru “Zero Waste Drive” or adoption of green policies (the 19th festival theme was “Inspiring the Community for a Greener Tomorrow”), has not been mitigated. The garbage collected throughout the 2014 festival still amounted to a 20-25 percent increase in Baguio’s “usual” daily collection of 175 tons of garbage (Agreda, 2014b). Second, on its socio-economic sustainability, interviewed business owners, residents, and tourists expressed ambivalent reactions, ranging from positive to negative, to simple nonchalance. For some (hotel owners, taxi operators, and those with businesses located in the central district, e.g., Burnham Park, City Market), the festival rakes in higher incomes. But for businesses and small stall-owners in the outskirts, it is “business as usual”. And then, there is the clamor for more transparency and accountability on earnings, and expenditures, by BFFFI. The City Tourism Officer shared that in terms of social capital, Panagbenga encourages teamwork, raises the standards for establishments as they all vie for the patronage of tourists, and encourages the public servants to be more courteous. But a number of tourists expressed dismay over thick crowds, heavy traffic, missing children, and petty crimes like pick pocketing, despite the increased police visibility. Quite alarming, a growing alienation is felt by residents, who have mastered the art of escaping the noise and the crowd, by simply staying at home or going out to nearby beaches. Local residents, who offered their assessments of the festival’s impact on their well-being over the last two decades, clearly distinguished between the ‘before’ (roughly, its first five years) and ‘now’ (the last decade) of Panagbenga. Overall, the Panagbenga before was deemed more attuned to their needs and desires as members of the ‘Baguio community.’ This included their need and desire to meet and bond with other local residents in a space conducive to socializing, to patronize products of local artisans and watch local musicians perform, all in a setting that respects the environment. Baguio residents expressed a nostalgia for the “Panagbenga before”, in as much as it promoted community, solidarity, and a sense of place. In short, it used to be “their festival”, in contrast to the “Panagbenga now” which has become insensitive to the local community and the people’s need to socialize and celebrate the local arts. Entries to the Landscaping Contest. Taken in February 2010 by Charmaine Liberato. Another area that is of concern is the commercialization of indigenous culture through the conduct of festivals and the failure to respect culturally significant sites, primarily in the context of the promotion of tourism in indigenous communities. Rituals, many of which are sacred and solemn in the culture of Indigenous Peoples, are being performed in these festivals without regard to their sacredness. Some of the festivals where Indigenous Peoples have raised concerns over the abuse of their rituals and the commercialization of their traditional songs and dances include the Lang-ay Festival in Mountain Province, the Adivay Festival in Benguet and the Panagbenga festival in Baguio City (86-87). In addition, interviews and write-ups complain that Panagbenga now has somehow reneged on its promise as a cultural festival, leading to the issue of the festival’s cultural sustainability. What is an authentic cultural representation? What constitutes the “bastardization of culture” as one cultural expert from the National Commission on Culture and the Arts, has noted on one occasion? Inextricably tied to these questions, given that Baguio has become multi-cultural and multi-ethnic is: whose culture, whose tradition? The demand that local cultures become incorporated in development agenda whereby so far, a uniform template for development conceived in the developed world has been imposed unilaterally on the developing or less developed, has issued from the clamor for equity in the distribution of benefits as well as costs of development. The avoidance of ethnocentrism and respect for local cultural integrity, are the twin preconditions of endogenous and sustainable development. For Gasper (2004), the big challenge posed by cultural differences to development, emanate from the importance of human diversity, the centrality of values aside from individual consumption, and, various views on the meaningful and cultured life. Gasper proposes ways of how to factor in culture in development without essentializing other cultures or without causing undue harm and humiliation to their bearers. Crocker (2008) also suggests principles on how to resolve local disputes about equitable cultural representation, through the vigilant practice and observation of deliberative democracy. I. Parker (2005:14-16) draws from Badiou’s 2001 work in his cautionary measures for conducting radical qualitative research in communities. With Parker’s permission, these words of caution can also serve as methodological guidelines for cultural policy, with slight changes in the wording: a) avoid starting with universal assumptions about a people’s culture; b) be aware how we might tend to treat the people of a certain culture as the same as us, or like us; c) respect for particularity is the route to transformation; d) let us not rush to resolve the points of impossibility in cultures, as they may reveal particular realities in people’s situations; and, e) cultures are not homogeneous. First, it is recognition and tolerance of cultural diversity, and effectively integrating it with biological diversity, in the term, biocultural diversity (Roosi and Poole, 2011 ). Recognition and tolerance of linguistic and cultural diversity best exemplified in indigenous communities is one of the principal values of the UN Millennium Declaration (Kates, et al., 2005). Kopfmüller (2011) adds to a better understanding of the link between biology and culture, in calling attention to nature’s cultural functions, that are played out in “sensory, contemplative, or aesthetic experiences” of nature. Furthermore, nature is a place of recovery. Even its scarcity promotes the development of human care to protect it. Second, it is allowing individuals and communities ethico-political spaces to reflect, contest, negotiate , and re-figure culture and cultural markers as necessary (Parodi 2011; Slater 1999). Third, realization that cultural impossibilities are routes to transformation (Slater 1999). Cultural sustainability is thus not about the permanent maintenance of a collective, such that cultures growing unsustainably will be at risk of extinction (Parodi, 2011). Neither can culture, nor cultural markers be preserved, because they are at best to be reflected upon, shaped, and modified. This requires political deliberation by stakeholders on what would be viable, and workable. 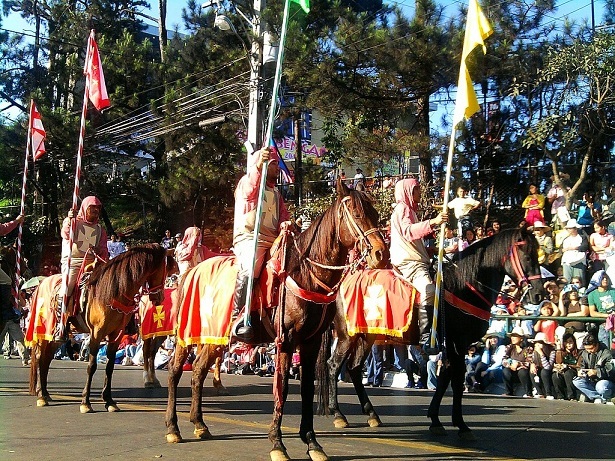 An entry to the Panagbenga Street Parade, the top attarction of the festival. Taken in February 2010 by Charmaine Liberato. Presbury and Edwards (2010) assert that socio-cultural and heritage protection is one of the three motivations of festivals (the other two being, infrastructure/economic development, and ecological protection). They are more emphatic and articulate in identifying the motivations, principles, measures, and indicators of culturally sustainable festivals. Culturally sustainable festivals promote not only the continuity of resources, but also “the continuity of culture, and the balances within culture, social creativity and freedom” (5). Their version of biocultural sustainability is protection and maintenance of the natural, built, and heritage resources of the planet. They likewise extol the virtues of diversity, tolerance and commitment which are the ingredients of ethical festivals. Local distinctiveness is expressed through promotion of local products and services unique to the place. Festivals should promote everything local, such as local music, arts, crafts, including sense of place, which refers to attachment to temporal-spatial settings, habitats, architecture, parks, zoos, public squares, interior and exterior spaces (see also Derrett, 2003). Presbury and Edwards contextualize sustainable festivals under the more general concern for sustainable tourism, which entails meeting “the needs of present tourists and host regions while protecting and enhancing opportunity for the future” , as stated in the declaration of the World Tourism Orgnization in 1995 (in Presbury and Edwards, 2010). Historically, indigenous feasts and celebration in the Cordillera played an important role in defining and reinforcing the identity of indigenous groups. A care for sustainability may be located in the way indigenous Igorot rituals and feasts were not only fine-tuned with natural cycles of the season, but with productive and reproductive work, and giving respect to deities. Some of these celebrations, such as the “feasts of merit complex” (Russell, 2007), were means of resource redistribution alongside political functions of gaining prestige, and political power (Russell, 2007; Bagamaspad and Hamada-Pawid 1985). However, when these feasts are presented for tourists’ consumption in the form of festivals, they can take on different, even contradictory, goals and values, as Russell (1989) found with the 1978 Grand Cañao in Baguio City. The Grand Cañao was organized by the local government and private sector to showcase indigenous cultures and promote tourism, but it was never repeated after problems related to the authenticity of the ritual performed and the divisiveness it caused between ethnic groups (Russell, 1989). Russell concluded: when rituals are presented in tourist contexts, organizers will face the difficulty of presenting “a traditional rendering of what is a very flexible religious and ritual complex in a contemporary setting that is far from traditional” (260). The Panagbenga of today is no different. From its roots as a community-ran platform for diverse indigenous Cordillera cultures, the festival has grown into a deliberately consumerist affair that banks on the festivalization of these cultures. The recommendations from festival management and stakeholders can be incorporated in the planning, and evaluation of the Panagbenga. They can be categorized in terms of increasing community participation and installing pro-environment and pro-people criteria for all festival activities. Firstly, based on the interviews, both management and local residents agree that there needs to be more meaningful participation of community members in the planning and staging of Panagbenga. 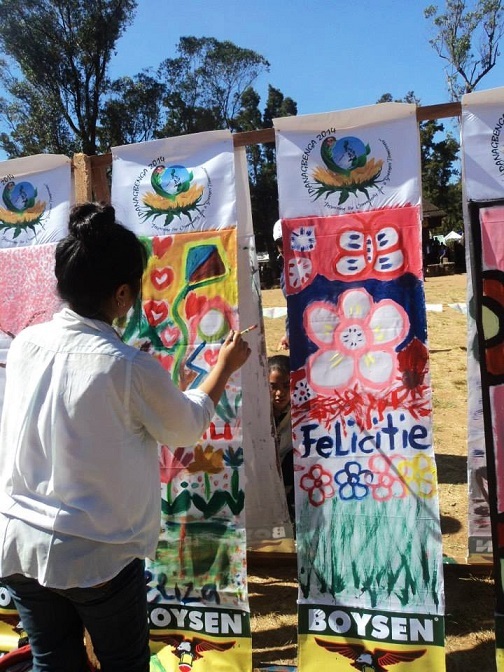 Residents wish to recall the sense they felt that Panagbenga was ‘a festival for Baguio by Baguio’, and highlight what Baguio, for them, is truly known for: a thriving culture and arts scene and a deeply environmentally conscious people. On the other hand, management wants better community participation in and ownership of festival activities, along with sustained incomes for businesses and sponsors. So, how can interests be balanced? One possibility is by conducting a multi-stakeholder forum where all sectors concerned can deliberate on the future of Panagbenga following the ethics of ‘deliberative participation’, as David Crocker (2008) elaborates. This process requires a skilled facilitator, collectively chosen by stakeholders, who can draw out the needs and desires of each sector and propose solutions to identified areas of disagreement or conflict – the assumption being that all sectors are willing to deliberate on an equal footing and come up with decisions that are amenable to the collective well-being. Secondly, a common recommendation from management and local stakeholders is for a ‘green criteria’ to be developed and applied to all Panagbenga activities. For example, during Session Road in Bloom, priority stalls could be pre-assigned to local artisans and cultural collectives to showcase their wares in prime spots of Session Road. In terms of traffic management – a major concern of local residents and visitors – steps must be taken to strongly encourage tourists to use public transportation or walk to places of interest. This could mean, as one resident suggested, leaving their vehicles at their hotels or in designated secure parking lots while ensuring availability of public shuttles, as well as the cleanliness of sidewalks. Concomitant to this, the entire festival could be diffused away from the city center to the other more scenic parts of the city by staging different activities in different venues. This would allow businesses in all areas of Baguio to benefit from the inflow of tourists. Occasionally, the pony boys from the Wright Park join the float parade, with their horses adorned with flowers, or the pony boys themselves dressed in historically significant regalia (here they are simulating medieval knights).Taken in February 2010 by Charmaine Liberato. Overall, however, within management, a shift must occur against measuring the success of Panagbenga based on quantitative indicators like the number of tourists, number of participants, and total revenue generated. Qualitative indicators must likewise be used to determine whether or not, and to what extent, Panagbenga contributed to the collective well-being of the Baguio community. This could be measured by the quality of participation of community members in all stages of the festival. Beyond the month-long festival, there is a pressing need to invest in the ongoing maintenance of public parks like Burnham Park, Botanical Garden, Mines View Park, Wright Park, and in the greening of the cityscape in general. In conclusion, the challenge to align Panagbenga with the principles of sustainability is of urgency, as was shown in the study. But it becomes significant and may be accomplished only when festival management and stakeholders agree on a vision for their cultural community and the festival’s place in it. Ultimately, there might be a need to re-value Panagbenga as a cultural festival that reflects and demonstrates the Baguio community’s cultures, and sense of place. 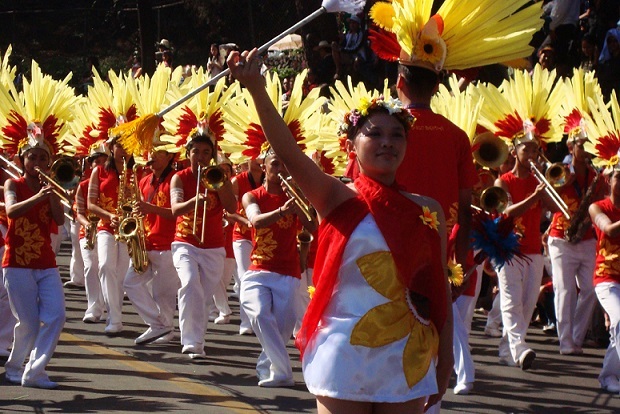 The launching of the First Ibaloy Festival in February 2014, as a subplot to Panagbenga’s 19th year creates optimism. It demonstrates how stakeholders and culture bearers can negotiate and agree not necessarily on timeless and eternal truths, but on what themes and aspects of culture to showcase and reconfigure dynamically for the year. Schumacher, E.F. (1989), Small is Beautiful: Economics as if People Mattered, New York: Harper and Row Publishers, Inc.
Aro, S. C. “Baguio City set for Influx of Tourists.” Midland Courier, February 23, 2003: 6. Midland Courier, “Panagbenga 2001.” February 11, 2001: 2. Gentozala, G. (1999), “Benguet blooms: The cutflower industry,” Asiageo, pp. 26-35. Pedrasa, I. “Panagbenga: Festival of Flowers and Schools of Thought,” available online: http://www.bulatlat.com/news/3-2/3-2-panagbenga.html, date Accessed: 13 March 2014. Ressureccion, B. E. (2014), “Panagbenga Festival: A history,” Philippine Star. Available online, URL: http://www.philstar.com/travel-and-leisure/festivals/panagbenga-2014/articles/2014/02/17/1291401/panagbenga-festival-a-history. Ressureccion, B. E. “Panagbenga Flower Festival”.available online:http://panagbengaflowerfestival.com/history/, date accessed: 20 March 2014. 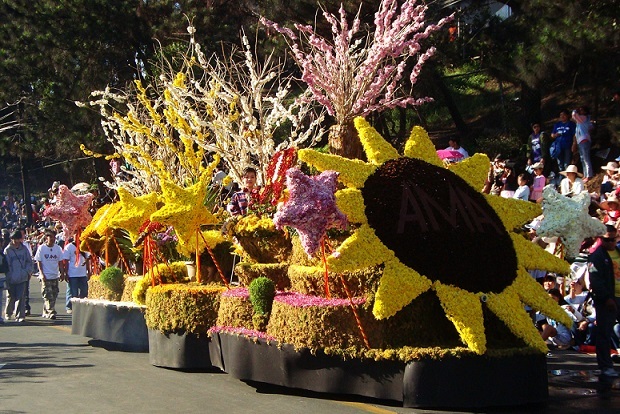 “Events at Panagbenga Festival.” available online: http://panagbengaflowerfestival.com/#events, date accessed: 19 March 2014. “History of Panagbenga.” available online: http://www.gobaguio.com/panagbenga/history-of-the-panagbenga.html#.UzLAAs49V3B,date accessed: 20 March 2014. Indigenous Peoples of the Philippines Indigenous Committee ICERD Shadow Report (to the UN Committee on the Elimination of all Forms of Racial Discrimination, 73rd Session, 2-28 August 2009. AO No. 008-S. 2014: Amending AO No. 194-S.2012 Reconstituting the different Panagbenga 2014 program committees, assigning persons to lead the committees and enumerating the activities therefor. Issued 28 January 2014.